The thermodynamics of stochastic non-Markovian systems is still widely unexplored. We present an analytical approach for the net steady-state heat flux in nonlinear overdamped systems subject to a continuous feedback force with a discrete time delay. We show that the feedback inevitably leads to a finite heat flow even for vanishingly small delay times. Application to an exemplary (bistable) system reveals that the feedback induces heating as well as cooling regimes and leads to a maximum of the medium entropy production at coherence resonance conditions. 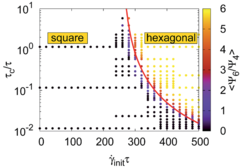 In this paper, we systematically derive a fourth-order continuum theory capable of reproducing mesoscale turbulence in a three-dimensional suspension of microswimmers. We start from overdamped Langevin equations for a generic microscopic model (pushers or pullers), which include hydrodynamic interactions on both small length scales (polar alignment of neighboring swimmers) and large length scales, where the solvent flow interacts with the order parameter field. The flow field is determined via the Stokes equation supplemented by an ansatz for the stress tensor. In addition to hydrodynamic interactions, we allow for nematic pair interactions stemming from excluded-volume effects. The results here substantially extend and generalize earlier findings [S. Heidenreich et al., Phys. Rev. E 94, 020601 (2016)], in which we derived a two-dimensional hydrodynamic theory. From the corresponding mean-field Fokker-Planck equation combined with a self-consistent closure scheme, we derive nonlinear field equations for the polar and the nematic order parameter, involving gradient terms of up to fourth order. We find that the effective microswimmer dynamics depends on the coupling between solvent flow and orientational order. 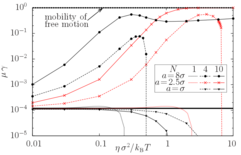 For very weak coupling corresponding to a high viscosity of the suspension, the dynamics of mesoscale turbulence can be described by a simplified model containing only an effective microswimmer velocity. 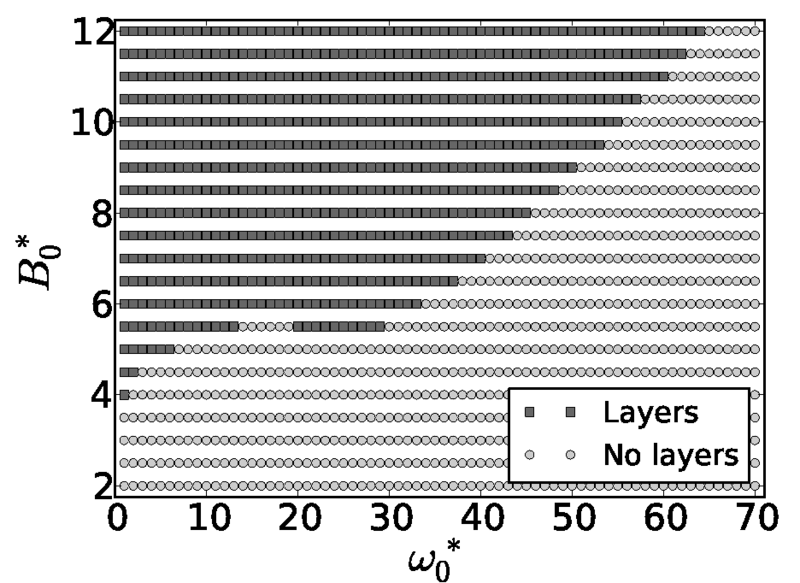 This paper is concerned with the Fokker-Planck (FP) description of classical stochastic systems with discrete time delay. The non-Markovian character of the corresponding Langevin dynamics naturally leads to a coupled infinite hierarchy of FP equations for the various n-time joint distribution functions. Here, we present an approach to close the hierarchy at the one-time level based on a linearization of the deterministic forces in all members of the hierarchy starting from the second one. This leads to a closed equation for the one-time probability density in the steady state. Considering two generic nonlinear systems, a colloidal particle in a sinusoidal or bistable potential supplemented by a linear delay force, we demonstrate that our approach yields a very accurate representation of the density as compared to quasiexact numerical results from direct solution of the Langevin equation. Moreover, the results are significantly improved against those from a small-delay approximation and a perturbation-theoretical approach. We also discuss the possibility of accessing transport-related quantities, such as escape times, based on an additional Kramers approximation. Our approach applies to a wide class of models with nonlinear deterministic forces. 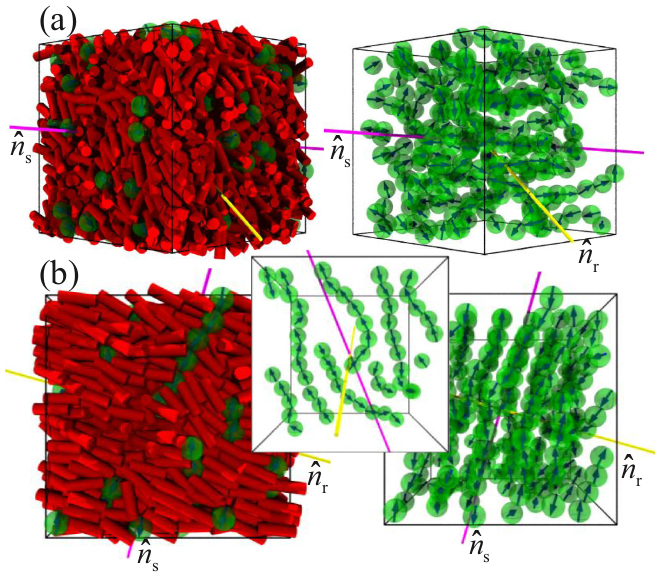 Using Brownian dynamics simulations, we investigate a dense system of charged colloids exposed to shear flow in a confined (slit-pore) geometry. The equilibrium system at zero flow consists of three well-pronounced layers with a squarelike crystalline in-plane structure. 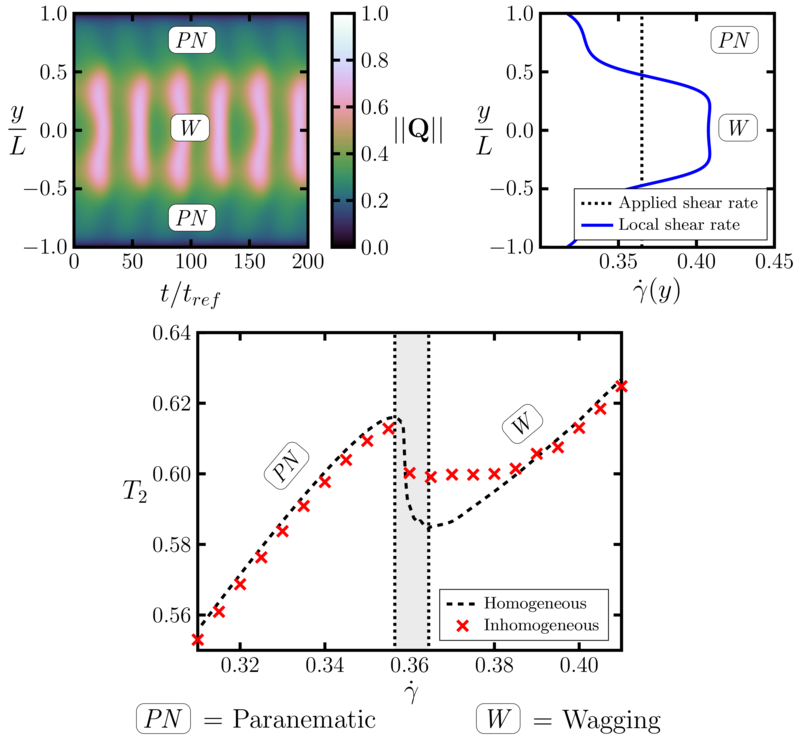 We demonstrate that, for sufficiently large shear rates, the middle layer separates into two sublayers where the particles organize into moving lanes with opposite velocities. 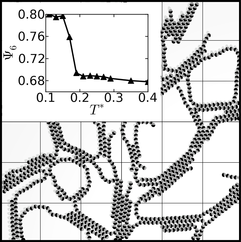 The formation of this “microlaned” state results in a destruction of the applied shear profile; it also has a strong impact on the structure of the system, and on its rheology as measured by the elements of the stress tensor. 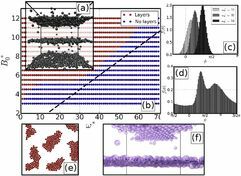 At higher shear rates, we observe a disordered state and finally a recrystallization reminiscent of the behavior of bilayer films. We also discuss the system size dependence and the robustness of the microlaned state against variations of the slit-pore width. In fact, for a pore width allowing for four layers, we observe a similar shear-induced state in which the system splits into two domains with opposite velocities. We investigate the occurrence of shear banding in nematogenic fluids under planar Couette flow, based on mesoscopic dynamical equations for the orientational order parameter and the shear stress. We focus on parameter values where the sheared homogeneous system exhibits regular oscillatory orientational dynamics, whereas the equilibrium system is either isotropic (albeit close to the isotropic-nematic transition) or deep in its nematic phase. The numerical calculations are restricted to spatial variations in shear gradient direction. 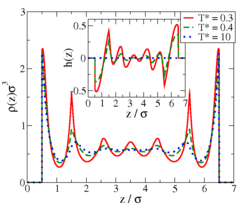 We find several new types of shear-banded states characterized by regions with regular oscillatory orientational dynamics. In all cases shear banding is accompanied by a non-monotonicity of the flow curve of the homogeneous system; however, only in the case of the initially isotropic system this curve has the typical S-like shape. We also analyze the influence of different orientational boundary conditions and of the spatial correlation length. 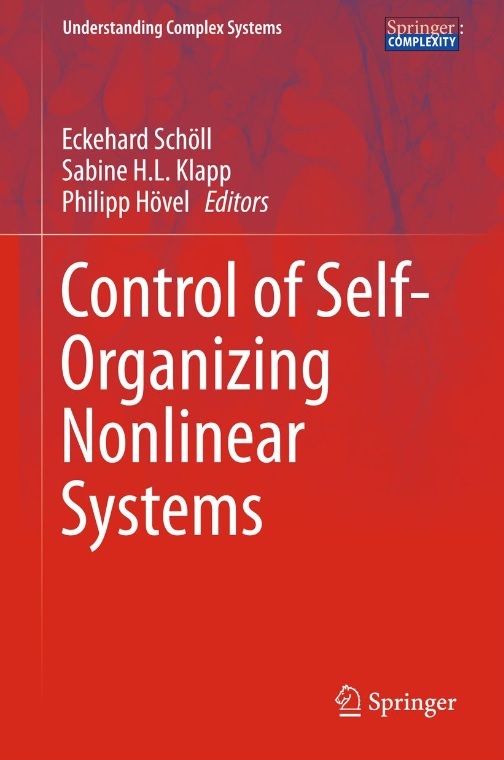 The book summarizes the state-of-the-art of research on control of self-organizing nonlinear systems with contributions from leading international experts in the field. The first focus concerns recent methodological developments including control of networks and of noisy and time-delayed systems. As a second focus, the book features emerging concepts of application including control of quantum systems, soft condensed matter, and biological systems. Special topics reflecting the active research in the field are the analysis and control of chimera states in classical networks and in quantum systems, the mathematical treatment of multiscale systems, the control of colloidal and quantum transport, the control of epidemics and of neural network dynamics. 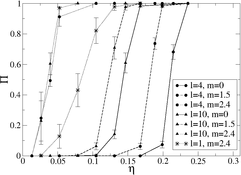 This article reviews recent research on the collective dynamical behavior of colloids with dipolar or multipolar interactions. Indeed, whereas equilibrium structures and static self-assembly of such systems are now rather well understood, the past years have seen an explosion of interest in understanding dynamicals aspects, from the relaxation dynamics of strongly correlated dipolar networks over systems driven by time-dependent, electric or magnetic fields, to pattern formation and dynamical control of active, self-propelled systems. Unraveling the underlying mechanisms is crucial for a deeper understanding of self-assembly in and out of equilibrium and the use of such particles as functional devices. At the same time, the complex dynamics of dipolar colloids poses challenging physical questions and puts forward their role as model systems for nonlinear behavior in condensed matter physics. Here we attempt to give an overview of these developments, with an emphasis on theoretical and simulation studies. 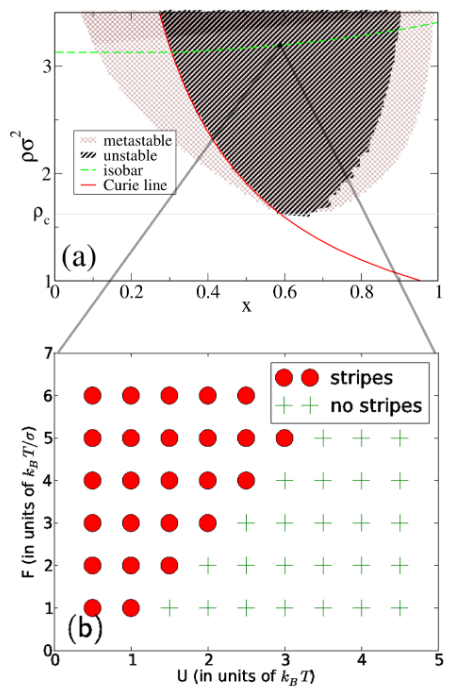 We investigate the self-organization of a binary mixture of similar sized rods and dipolar soft spheres by means of Monte-Carlo simulations. We model interparticle interactions by employing anisotropic Gay-Berne, dipolar and soft-sphere interactions. In the limit of vanishing magnetic moments we obtain a variety of fully miscible liquid crystalline phases including nematic, smectic and lamellar phases. For the magnetic mixture, we find that the liquid crystalline matrix supports the formation of orientationally ordered ferromagnetic chains. Depending on the relative size of the species the chains align parallel or perpendicular to the director of the rods forming uniaxial or biaxial nematic, smectic and lamellar phases. As an exemplary external perturbation we apply a homogeneous magnetic field causing uniaxial or biaxial ordering to an otherwise isotropic state. Feedback control schemes are a promising way to manipulate transport properties of driven colloidal suspensions. 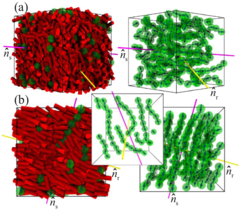 In the present article, we suggest a feedback scheme to enhance the collective transport of colloidal particles with repulsive interactions through a one-dimensional tilted washboard potential. The control is modeled by a harmonic confining potential, mimicking an optical "trap," with the center of this trap moving with the (instantaneous) mean particle position. Our theoretical analysis is based on the Smoluchowski equation combined with dynamical density functional theory for systems with hard-core or ultrasoft (Gaussian) interactions. For either type of interaction, we find that the feedback control can lead to an enhancement of the mobility by several orders of magnitude relative to the uncontrolled case. 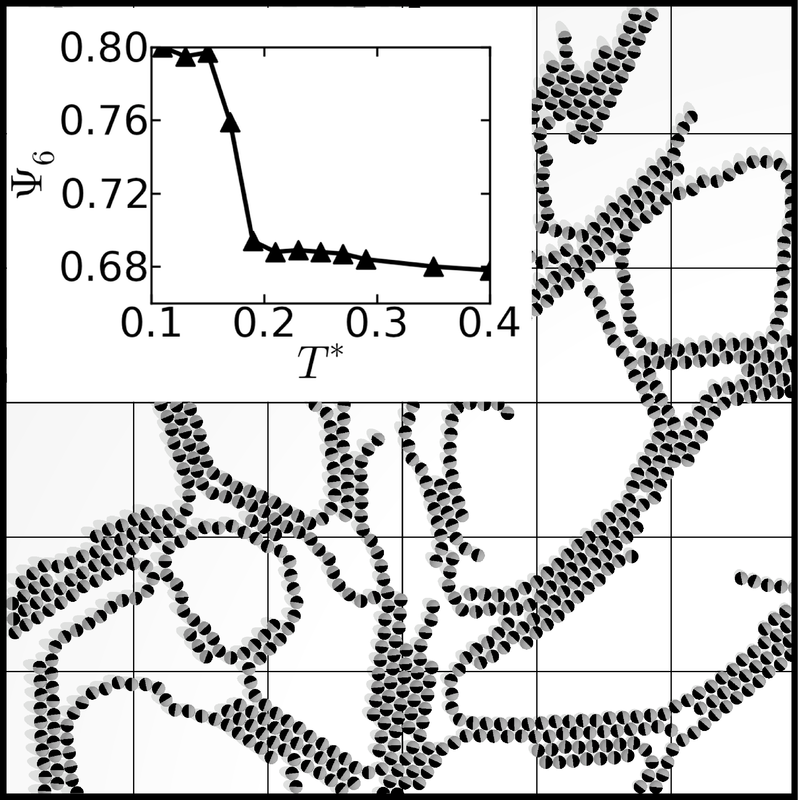 The largest effects occur for intermediate stiffness of the trap and large particle numbers. Moreover, in some regions of the parameter space the feedback control induces oscillations of the mean velocity. Finally, we show that the enhancement of mobility is robust against a small time delay in implementing the feedback control. 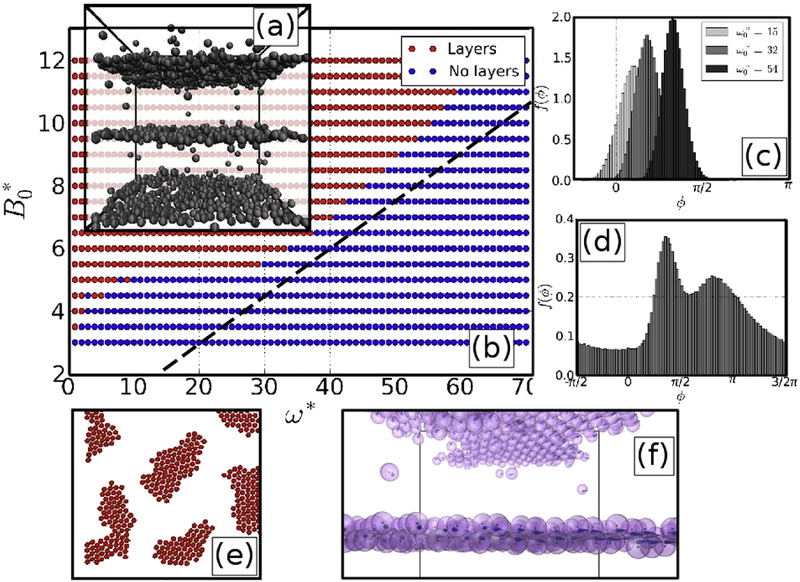 Using Monte Carlo computer simulations we explore the self-assembly and ordering behavior of a hybrid, soft magnetic system consisting of small magnetic nanospheres in a liquid-crystalline (LC) matrix. Inspired by recent experiments with colloidal rod matrices, we focus on conditions where the sphere and rod diameters are comparable. Already in the absence of a magnetic field, the nematic ordering of the LC can stabilize the formation of magnetic chains along the nematic or smectic director, yielding a state with local (yet no macroscopic) magnetic order. The chains, in turn, increase the overall nematic order, reflecting the complex interplay of the structure formation of the two components. When increasing the sphere diameter, the spontaneous uniaxial ordering is replaced by biaxial lamellar morphologies characterized by alternating layers of rods and magnetic chains oriented perpendicular to the rod's director. These ordering scenarios at zero field suggest a complex response of the resulting hybrid to external stimuli, such as magnetic fields and shear forces. Using Brownian dynamics (BD) simulations we investigate the non-equilibrium structure formation of a two-dimensional (2D) binary system of dipolar colloids propelling in opposite directions. Despite a pronounced tendency for chain formation, the system displays a transition towards a laned state reminiscent of lane formation in systems with isotropic repulsive interactions. However, the anisotropic dipolar interactions induce novel features: First, the lanes have themselves a complex internal structure characterized by chains or clusters. Second, laning occurs only in a window of interaction strengths. We interpret our findings by a phase separation process and simple force balance arguments. Using Brownian Dynamics (BD) simulations we investigate non-equilibrium transitions of sheared colloidal films under controlled shear stress σxz. In our approach the shear rate is a dynamical variable, which relaxes on a time scale τc such that the instantaneous, configuration-dependent stress σxz(t) approaches a pre-imposed value. 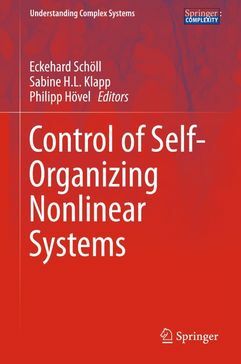 Investigating the dynamics under this “feedback-control” scheme we find unique behavior in regions where the flow curve σxz() of the uncontrolled system is monotonic. However, in non-monotonic regions our method allows to select between dynamical states characterized by different in-plane structure and viscosities. Indeed, the final state strongly depends on τc relative to an intrinsic relaxation time of the uncontrolled system. 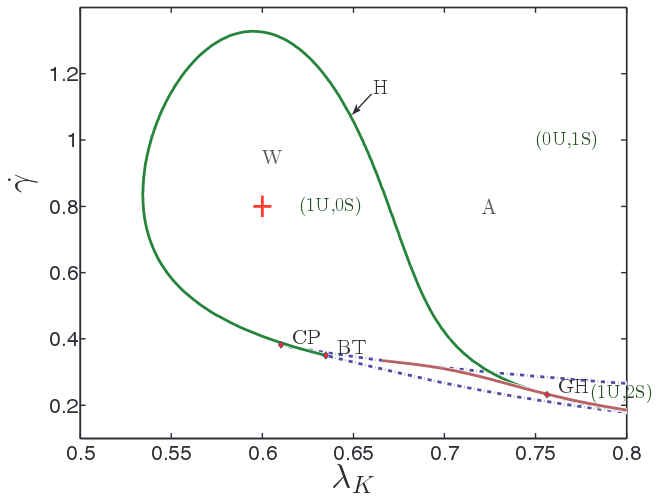 The critical values of τc are estimated on the basis of a simple model. We present an approach for calculating coarse-grained angle-resolved effective pair potentials for uniaxial molecules. 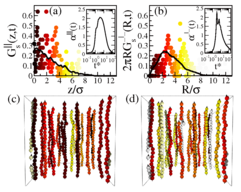 For integrating out the intramolecular degrees of freedom we apply umbrella sampling and steered dynamics techniques in atomistically-resolved molecular dynamics (MD) computer simulations. Throughout this study we focus on disk-like molecules such as coronene. To develop the methods we focus on integrating out the van der Waals and intramolecular interactions, while electrostatic charge contributions are neglected. The resulting coarse-grained pair potential reveals a strong temperature and angle dependence. In the next step we fit the numerical data with various Gay-Berne-like potentials to be used in more efficient simulations on larger scales. 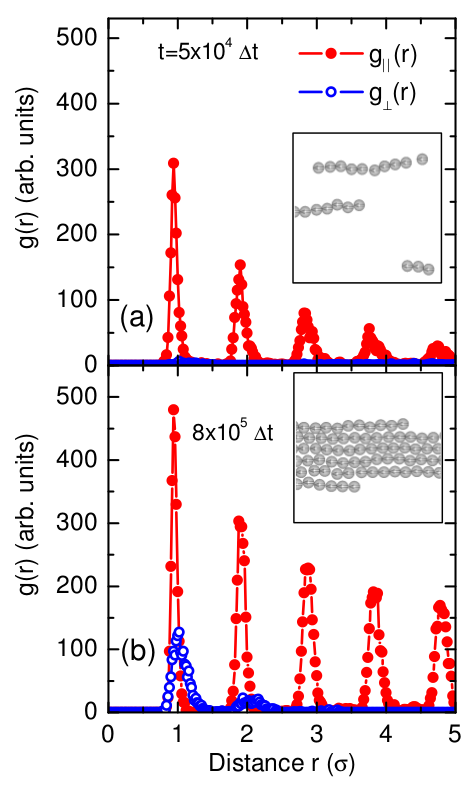 The quality of the resulting coarse-grained results is evaluated by comparing their pair and many-body structure as well as some thermodynamic quantities self-consistently to the outcome of atomistic MD simulations of many-particle systems. We find that angle-resolved potentials are essential not only to accurately describe crystal structures but also for fluid systems where simple isotropic potentials start to fail already for low to moderate packing fractions. Further, in describing these states it is crucial to take into account the pronounced temperature dependence arising in selected pair configurations due to bending fluctuations. Molecular semiconductors are increasingly used in devices, but understanding of elementary nanoscopic processes in molecular film growth is in its infancy. 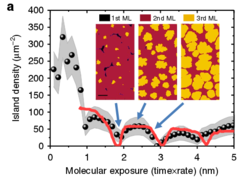 Here we use real-time in situ specular and diffuse X-ray scattering in combination with kinetic Monte Carlo simulations to study ​C60 nucleation and multilayer growth. We determine a self-consistent set of energy parameters describing both intra- and interlayer diffusion processes in ​C60 growth. This approach yields an effective Ehrlich–Schwoebel barrier of EES=110 meV, diffusion barrier of ED=540 meV and binding energy of EB=130 meV. Analysing the particle-resolved dynamics, we find that the lateral diffusion is similar to colloids, but characterized by an atom-like Schwoebel barrier. 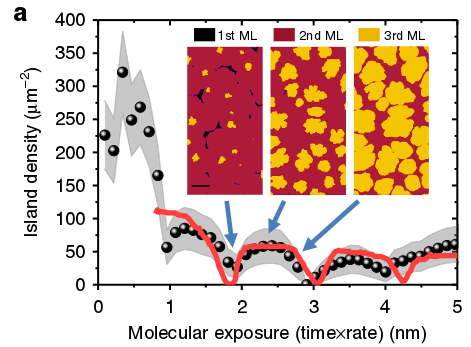 Our results contribute to a fundamental understanding of molecular growth processes in a system, which forms an important intermediate case between atoms and colloids. Based on Dynamical Density Functional Theory (DDFT) we investigate a binary mixture of interacting Brownian particles driven over a substrate via a one-dimensional ratchet potential. The particles are modeled as soft spheres where one component carries a classical Heisenberg spin. In the absence of a substrate field, the system undergoes a first-order fluid-fluid demixing transition driven by the spin-spin interaction. 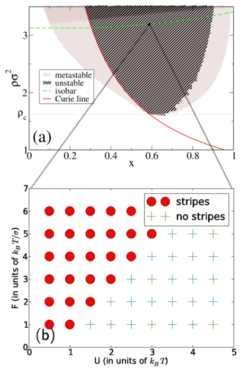 We demonstrate that the interplay between the intrinsic spinodal decomposition and time-dependent external forces leads to a novel dynamical instability where stripes against the symmetry of the external potential form. This structural transition is observed for a broad range of parameters related to the ratchet potential. Moreover, we find intriguing effects for the particle transport. Based on a continuum theory, we investigate the manipulation of the non-equilibrium behavior of a sheared liquid crystal via closed-loop feedback control. Our goal is to stabilize a specific dynamical state, that is, the stationary "flow-alignment", under conditions where the uncontrolled system displays oscillatory director dynamics with in-plane symmetry. To this end we employ time-delayed feedback control (TDFC), where the equation of motion for the ith component, q_i(t), of the order parameter tensor is supplemented by a control term involving the difference q_i(t)-q_i(t-\tau). In this diagonal scheme, \tau is the delay time. We demonstrate that the TDFC method successfully stabilizes flow alignment for suitable values of the control strength, K, and \tau; these values are determined by solving an exact eigenvalue equation. Moreover, our results show that only small values of K are needed when the system is sheared from an isotropic equilibrium state, contrary to the case where the equilibrium state is nematic. 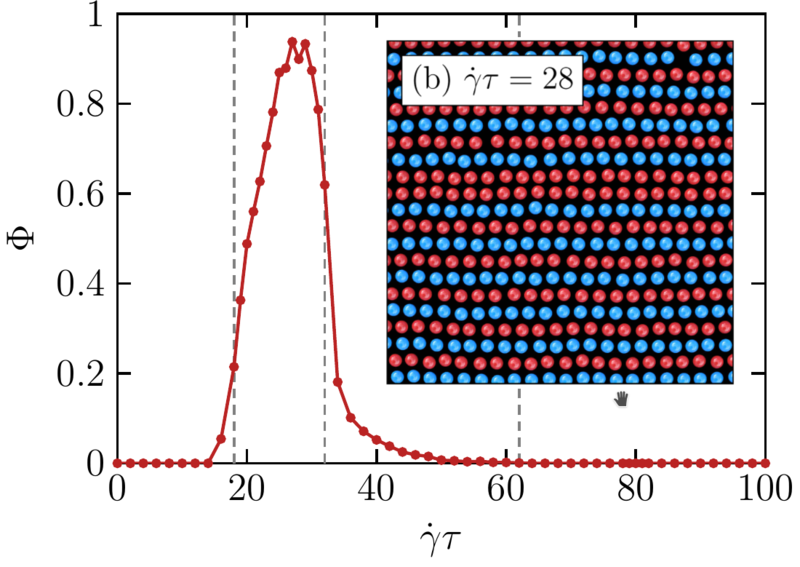 We report computer simulation results on the cluster formation of dipolar colloidal particles driven by a rotating external field in a quasi-two-dimensional setup. We focus on the interplay between permanent dipolar and hydrodynamic interactions and its influence on the dynamic behavior of the particles. This includes their individual as well as their collective motion. To investigate these characteristics, we employ Brownian dynamics simulations of a finite system with and without hydrodynamic interactions. 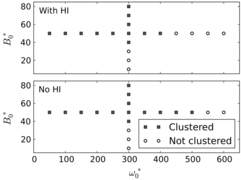 Our results indicate that hydrodynamic interactions have a profound impact on the dynamic behavior of the clusters and the dynamics of the clustering process. 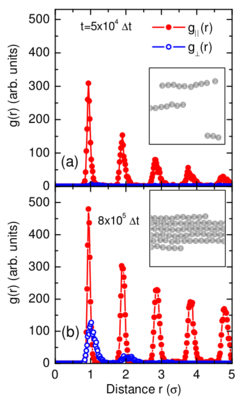 Based on Monte Carlo and Molecular Dynamics computer simulations we investigate the aggregation patterns and dynamics of model colloidal mixtures consisting of particles with either one or two, oppositely oriented, induced dipole moments. The mixtures are confined to two spatial dimensions. Our model is inspired by recent optical-microscopy experiments involving polystyrene particles with (and without) gold patches. 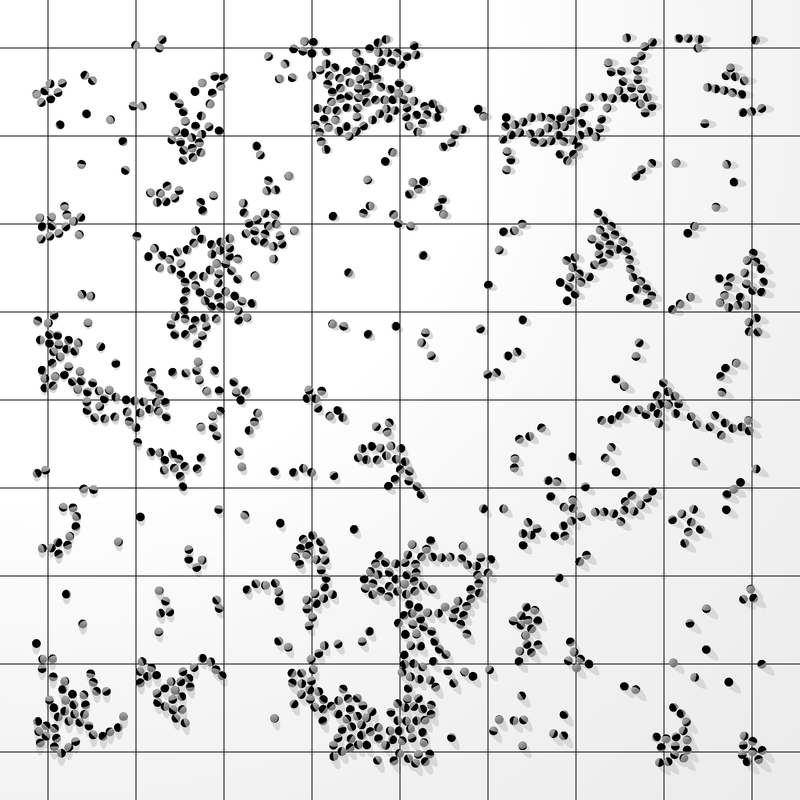 For a broad range of parameters, we find the model systems to self-assemble via a two-step scenario involving first percolation along the field, followed by a percolation transition in the transverse direction. 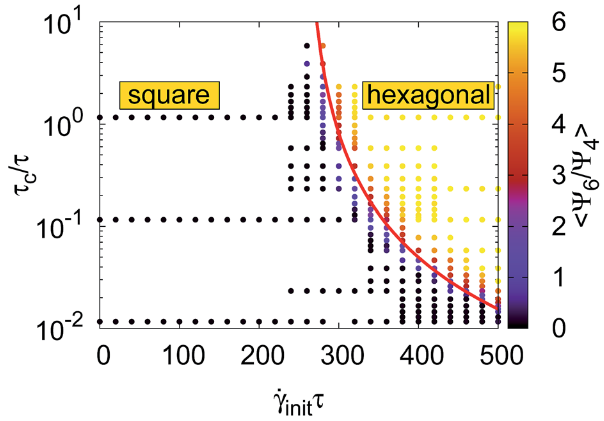 The resulting two-dimensional networks are characterized by strongly hindered translational dynamics. 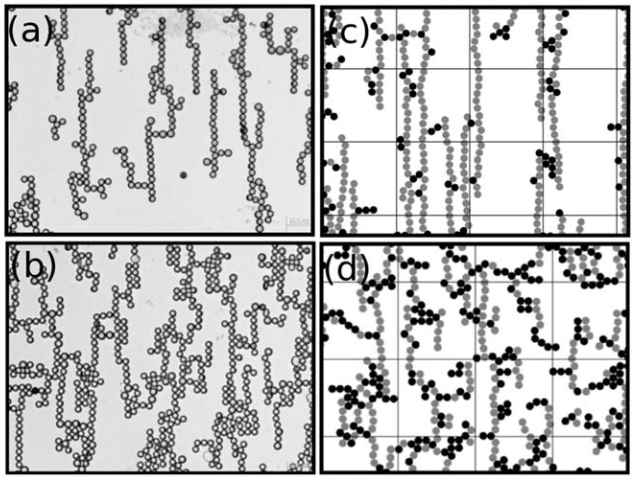 In colloidal suspensions, self-organization processes can be easily fueled by external fields. Here we consider monolayers of particles with permanent dipole moments that are driven by rotating external fields. In recent experiments, it has been shown that the particles in such systems self-organize into two-dimensional clusters. Here we report results from a computer simulation study of these pattern forming systems. Specifically, we employ Langevin dynamics simulations, Brownian dynamics simulations that include hydrodynamic interactions, and Wang-Landau Monte Carlo simulations of soft spheres interacting via dipolar potentials. We investigate at which field strengths and frequencies clusters form and explore the influence of hydrodynamic interactions. 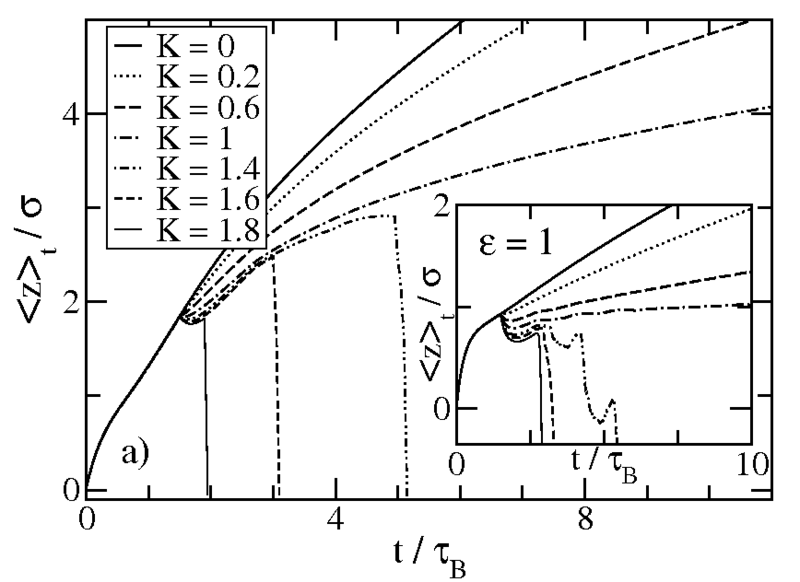 We also examine the phase behavior of the equilibrium system resulting from a time average of the colloidal interactions in the rotating field. In this way we demonstrate that the clustering described in the driven system arises from a first-order phase transition between a vapor and a condensed phase. Based on Monte Carlo (MC) computer simulations we study the structure formation of a system of magnetic nanorods. 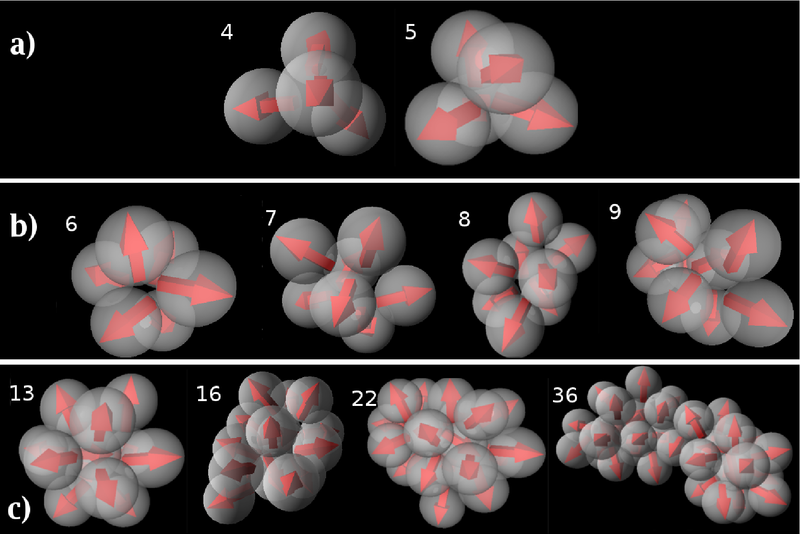 Our model particles consist of fused spheres with permanent magnetic dipole moments, as inspired by recent experiments. The resulting system behaves significantly different from that of a system of hard (non-magnetic) rods or magnetic rods with a single longitudinal dipole. In particular, we observe for the magnetic nanorods a significant decrease of the percolation threshold (as compared to non-magnetic rods) at low densities, and a stabilization of the high-density nematic phase. Moreover, the percolation threshold is tunable by an external magnetic field. We apply molecular dynamics simulations to investigate the structure formation of amphiphilic Janus particles in the bulk phase. 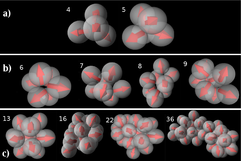 The Janus particles are modeled as (soft) spheres composed of a hydrophilic and hydrophobic part. Their orientation is described by a vector representing an internal degree of freedom. 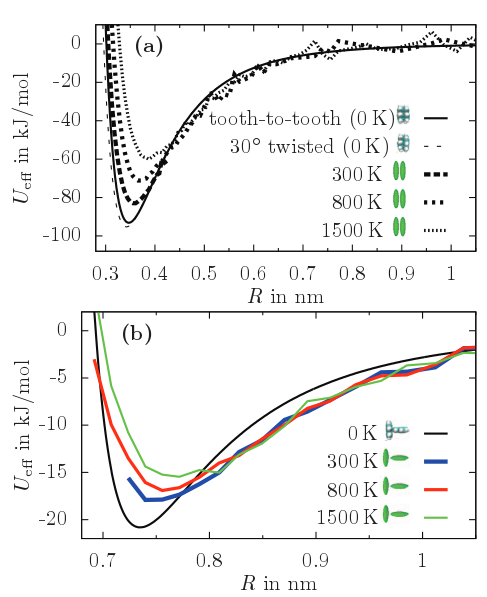 Investigating energy fluctuations and cluster size distributions, we determine the aggregation line in a temperature-density-diagram, where the reduced temperature is an inverse measure for the anisotropic coupling. 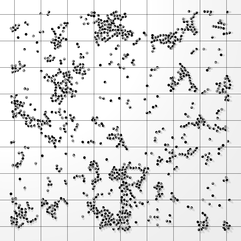 Below this aggregation line clusters of various sizes depending on density and reduced temperature are found. 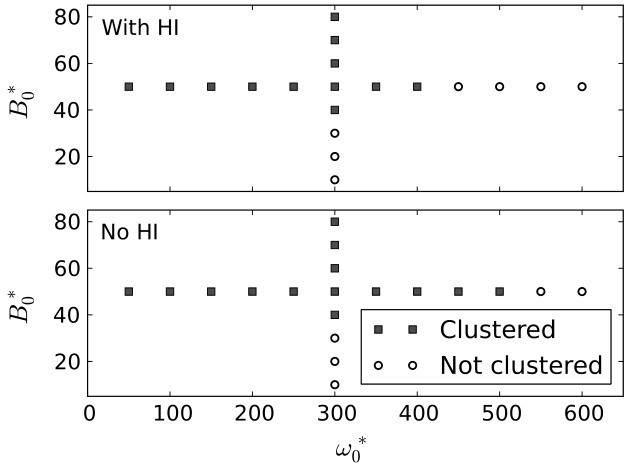 For low densities in the range rho * <~ 0.3, the cluster size distribution has a broad maximum, indicating simultaneous existence of various cluster sizes between 5 and 10. We find no hint of a condensation transition of these clustered systems. In the case of higher densities ( rho * = 0.5 and 0.6), the cluster size distribution shows an extremely narrow peak at clusters of size 13. In these icosahedrons, the particles are arranged in a closed-packed manner, thereby maximizing the number of bonds. Analyzing the translational mean-square displacement we also observe indications of hindered diffusion due to aggregation. 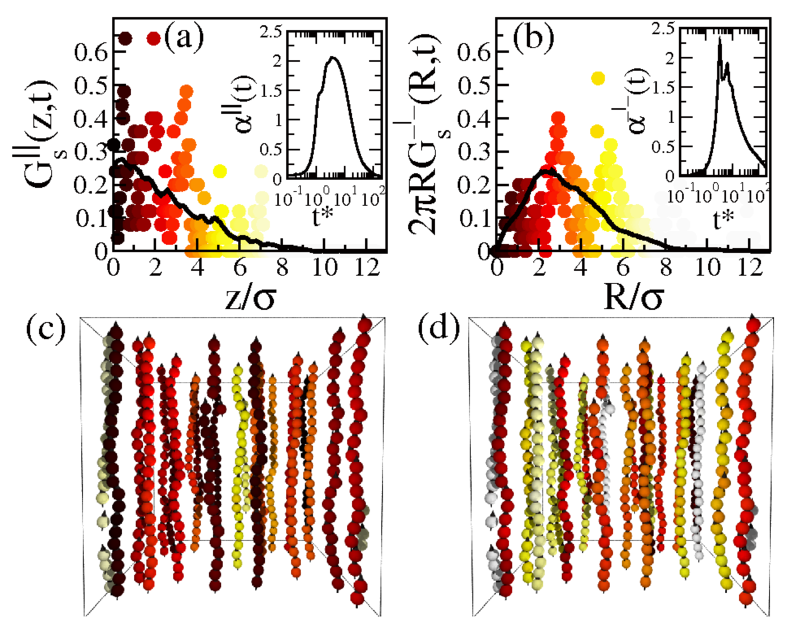 Based on Discontinuous Molecular Dynamics (DMD) simulations we present a phase diagram of two-dimensional nano-particles with dipole-like short-ranged interactions. Similar to systems with true, long-ranged dipolar interactions the present system undergoes a transition from an isotropic fluid phase into a polymer-like fluid, characterized by an association of most particles into clusters. Further decrease of the temperature leads to a percolated system which, moreover, displays dynamical properties reminiscent of a gel. Specifically, we find a plateau in the mean-squared displacement and a non-gaussian behavior of the self-part of the van Hove correlation function. In the high density region we observe crystallization from the isotropic fluid into a solid phase with hexagonal order. Surprisingly, the crystallization is accompanied by a global parallel ordering of the dipole moments, i.e., a ferroelectric phase. This behavior is in marked contrast to what is found in 2D systems with long-ranged dipolar interactions. Our results allow insights into the design of gel-like or highly ordered structures at interfaces, shells around droplets and bubbles and new-sheet like materials. Combining nuclear magnetic resonance and molecular dynamics simulations, we unravel the long-time dynamics of a paradigmatic colloid with strong dipole-dipole interactions. 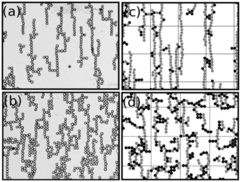 In a homogeneous magnetic field, ionic ferrofluids exhibit a stepwise association process from ensembles of monomers over stringlike chains to bundles of hexagonal zipped-chain patches. 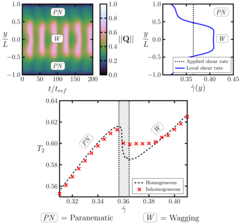 We demonstrate that attractive van der Waals interactions due to charge-density fluctuations in the magnetic particles play the key role for the dynamical stabilization of the hexagonal superstructures against thermal dissociation. Our results give insight into the dynamics of self-organization in systems dominated by dipolar interactions. Using molecular dynamics simulations we investigate the translational dynamics of particles with dipolar interactions in homogenous external fields. 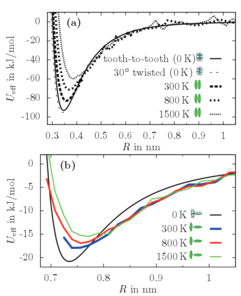 For a broad range of concentrations, we find that the anisotropic, yet normal diffusive behavior characterizing weakly coupled systems becomes anomalous both parallel and perpendicular to the field at sufficiently high dipolar coupling and field strength. 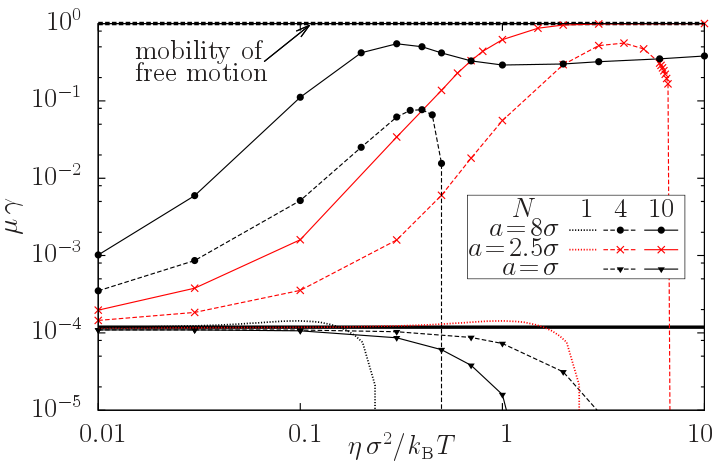 After the ballistic regime, chain formation first yields cagelike motion in all directions, followed by transient, mixed diffusive-superdiffusive behavior resulting from cooperative motion of the chains. The enhanced dynamics disappears only at higher densities close to crystallization. 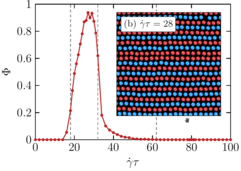 We report Brownian dynamics (BD) simulation and theoretical results for a system of spherical colloidal particles with permanent dipole moments in a rotating magnetic field. 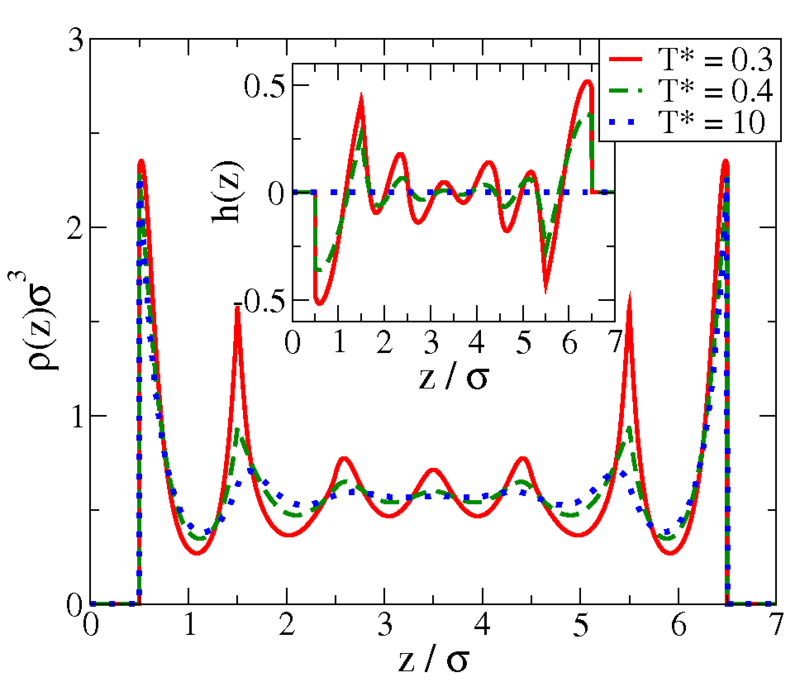 Performing simulations at a fixed packing fraction and dipole coupling parameter, we construct a full non-equilibrium phase diagram as function of the driving frequency (ω0) and field strength (B0). 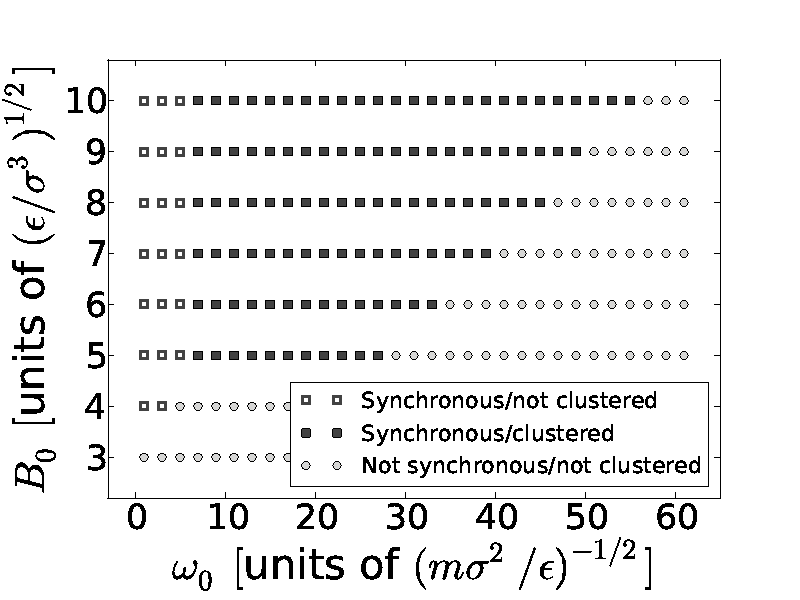 This diagram contains both synchronized states, where the individual particles follow the field with (on average) constant phase difference, and asynchronous states. The synchronization is accompanied by layer formation, i.e. by spatial symmetry-breaking, similar to systems of induced dipoles in rotating fields. 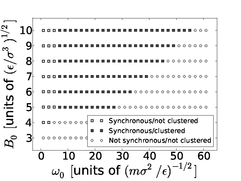 In the permanent-dipole case, however, too large ω0 yield a breakdown of layering, supplemented by complex changes of the single-particle rotational dynamics from synchronous to asynchronous behavior. 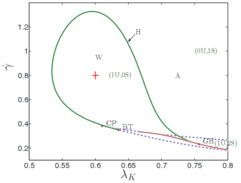 We show that the limit frequencies ωc can be well described as a bifurcation in the nonlinear equation of motion of a single particle rotating in a viscous medium. Finally, we present a simple density functional theory, which describes the emergence of layers in perfectly synchronized states as an equilibrium phase transition. We investigate the structure formation of amphiphilic molecules at planar walls using density functional theory. The molecules are modeled as (hard) spheres composed of a hydrophilic and hydrophobic part. The orientation of the resulting Janus particles is described as a vector representing an internal degree of freedom. Our density functional approach involves fundamental measure theory combined with a mean-field approximation for the anisotropic interaction. 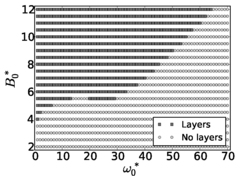 Considering neutral, hydrophilic, and hydrophobic walls, we study the adsorption of the particles, focusing on the competition between the surface field and the interaction-induced ordering phenomena. Finally, we consider systems confined between two planar walls. It is shown that the anisotropic Janus interaction yields pronounced frustration effects at low temperatures. 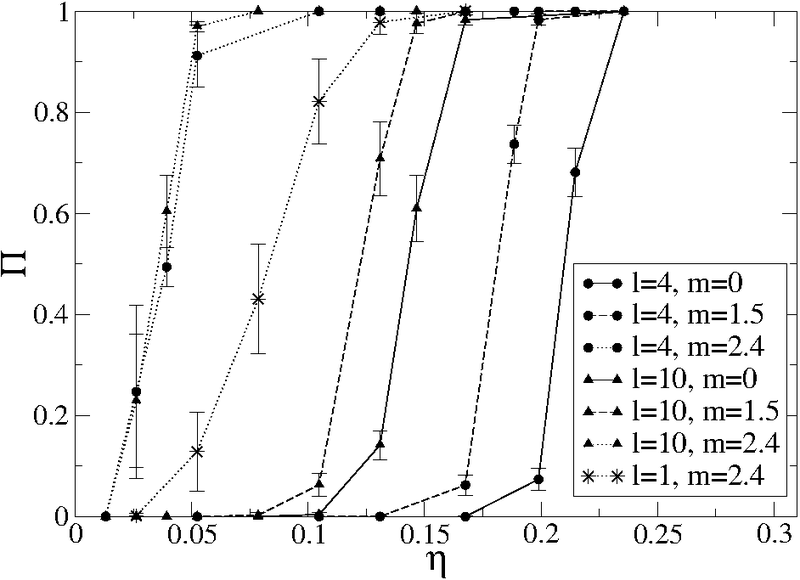 In this work, we study condensation phase transitions of two-dimensional Stockmayer fluids under additional external fields using Monte-Carlo (MC) simulations in the grand-canonical ensemble. We employ two recently developed methods to determine phase transitions in fluids, namely Wang–Landau (WL) MC simulations and successive-umbrella (SU) sampling. Considering first systems in zero field (and dipolar coupling strengths μ2/εσ3 ⩽ 6), we demonstrate that the two techniques yield essentially consistent results but display pronounced differences in terms of efficiency. Indeed, comparing the computation times for these systems on a qualitative level, the SU sampling turns out to be significantly faster. In the presence of homogeneous external fields, however, the SU method becomes plagued by pronounced sampling difficulties, yielding the calculation of coexistence lines essentially impossible. Employing the WL scheme, on the other hand, we find phase coexistence even for strongly field-aligned systems. The corresponding critical temperatures are significantly shifted relative to the zero-field case. Based on dynamical density functional theory (DDFT) we consider a non-equilibrium system of interacting colloidal particles driven by a constant tilting force through a periodic, symmetric "washboard" potential. We demonstrate that, despite pronounced spatio-temporal correlations, the particle current can be reversed by adding suitable feedback control terms to the DDFT equation of motion. We explore two distinct control protocols with time delay, focussing on either the particle positions or the density profile. Our study shows that the DDFT is an appropriate framework to implement time-delayed feedback control strategies widely used in other fields of non-linear physics. 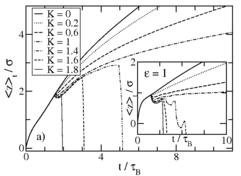 Based on a mesoscopic theory we investigate the nonequilibrium dynamics of a sheared nematic liquid, with the control parameter being the shear stress σxy (rather than the usual shear rate, γ̇). To this end we supplement the equations of motion for the orientational order parameters by an equation for γ̇, which then becomes time dependent. Shearing the system from an isotropic state, the stress-controlled flow properties turn out to be essentially identical to those at fixed γ̇. Pronounced differences occur when the equilibrium state is nematic. Here, shearing at controlled γ̇ yields several nonequilibrium transitions between different dynamic states, including chaotic regimes. The corresponding stress-controlled system has only one transition from a regular periodic into a stationary (shear-aligned) state. The position of this transition in the σxy-γ̇ plane turns out to be tunable by the delay time entering our control scheme for σxy. Moreover, a sudden change in the control method can stabilize the chaotic states appearing at fixed γ̇.